Considering rolling my college/university credits into an “Individual Studies” or “Multidisciplinary Program” for a BA Degree. I may even be able to apply the books I’ve written, the Connecting The Dots With The Respect Principle concept, company, and global initiative I’ve developed and launched, the play I have written, am producing, directing, and filming for schools and communities, etc. as credits too. Only time will tell. As for the university, there are several to consider. Options … lots of options … more than we may realize … so have fun and explore! A recent experience inspired me to write this for anyone seething underneath with some negative emotion and then acting out … either at yourself or others, even those not the source of the problem. There is always a choice even though the alternatives may seem too hard. Nonetheless, having the needed conversation, which is always an option, though not necessarily an easy one, is still better in the end rather than ignoring the problem … because as much as we erroneously believe the problem will go away, it will not and it will also result in various levels of destruction in our own health, in our relationships, and in our connection … or disconnection with the world. I know this because repeatedly I have been there and done and it never solved the problem. Now, I do press to have the needed conversations, no matter how difficult, in order to do what I can do to resolve strife … because then I can walk, rather than run or hide away, leaving the other party to make their choice, so I can decide what to do based on the conversation, everyone’s decisions and actions. Still, the outcome is not always what we want, but in the end is always the best … a higher Respect Level action that will at the very least free us from what tears so many up inside and hardens hearts. Learn more at © www.therespectprinciple.com All Rights Reserved. 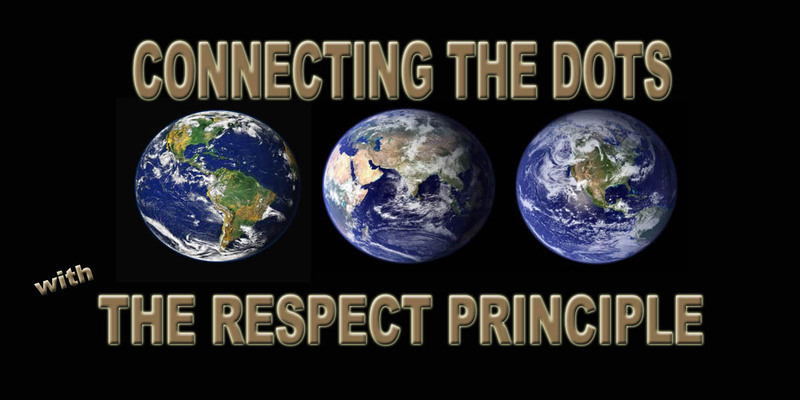 Raising my Respect Level was a healing process that took years because of the lack of such a device as the Respect Scale and the philosophy presented in Connecting the Dots … with The Respect Principle books, products, and services. The research, analysis, and development of the core concept empowered me to reclaim the parts of me discarded or oppressed due to lack of approval or support, including writing as a profession, to educate, inspire, and entertain through the establishment of my company … a social business venture, a for-profit business, dedicated to meeting the social need of raising individual and humanity’s Respect Level for the benefit of all people.